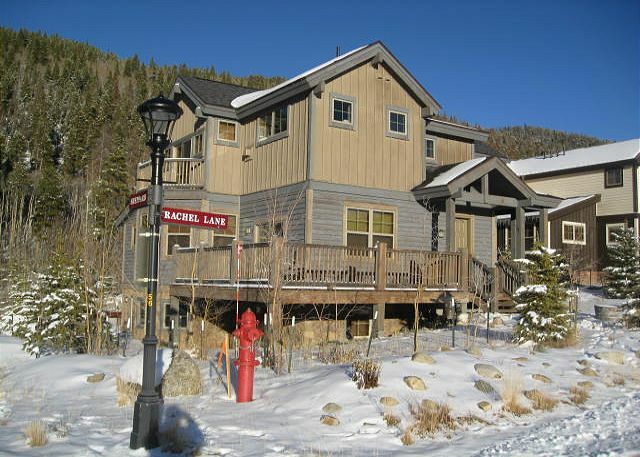 Views, amenities and style make Rachel Lane the perfect mountain escape for any season! This home is beautifully decorated in a sophisticated mountain style, with vaulted ceilings above a stone gas fireplace and a comfortably furnished living room. Outside there is a deck and a patio, a gas grill, a private hot tub and gorgeous mountain views. You’ll love everything about Rachel Lane! This lovely 4-bedroom, 4.5-bathroom premium home is the perfect retreat for families or groups of up to 11 people. The main level has a very open layout, and there is plenty of seating in the living area with an LCD TV and fireplace perfect for relaxing next to. The fully equipped kitchen has granite countertops, stainless steel appliances and everything else you’ll need to make big mountain meals for your group. The cozy dining area has a large pine table with seating for eight people, and there is room for three more at the breakfast bar. The lower family room has a large LCD TV with a home theater system, a foosball table, and another fully equipped kitchen. Other amenities include complimentary Wi-Fi, two washers/dryers and a garage with additional driveway parking (4 vehicles total). Don’t miss staying at this beautiful home and enjoying the views. Call or book online today! Master Suite: king bed, private bathroom with jetted tub and separate walk-in shower, gas fireplace, private balcony with mountain views. Queen Suite: queen bed, private bathroom with tub/shower. Bunk Suite: captain’s bunk (twin over full), private bathroom with tub/shower. Parking: 1-car garage, 3 outdoor spaces – 4 spaces total. Business and Occupancy License #46855. Water leak in basement was a problem. Even after fixing the leak, soaked carpet, etc. created mold. SMR provided alternate accommodations for couple and their two children who were staying on that level to resolve situation. I recognize problems can arise and SMR handled it professionally and to our satisfaction. Rented this home for a weekend golf stay in the mountains. Absolutely everything I had hoped for. The house was clean and stocked with everything we needed- we would definitely stay here again! Had a fantastic time. Very spacious. There were a few issues, but were taken care of right away. Beautiful views. Hi Gloria. Thank you for your feedback. I am happy to hear we were able to quickly rectify the issues. Thank you again. We enjoyed the house, it was bigger than the pictures showed. The house was very clean and filled with everything we needed, soap towels and even kitchen spices. The house was a short walk to the bus stop and the bus is usually always on time. We would definitely come back to this house. The property management company was excellent. They were very easy to work with and answered all of our questions. Our family of six adults spent a comfortable, relaxed weekend on Rachel lane. there was plenty of room for us to stretch out and pursue individual interests as well as quality group space. The house is well located, near a lovely walking/bike path, close to town but very quiet. We received lots of good advice from summit rentals. The staff fixed a situation and made certain that our short vacation turned out great. We really appreciated the beautiful home with wonderful views. Thanks again. I loved the house so much. My family wanted to stay longer. If we travel back to Breckenridge we will definitely stay again at Rachel Lane. Overall, we loved our stay at Rachel Lane. We were a group of 11 adults in our 20's & 30's and found the house to be spacious, clean, comfortable, and conveniently located to the shuttle bus (less than 5 minute walk). The kitchen was well stocked and we were able to enjoy a group dinner at the large dining room table. The hot tub was the perfect was to end a long day of skiing. The only complaint we had is that the house does not sleep 11 people, as listed. The downstairs pull out couch can only comfortably sleep one person. Thank you for your feedback Katie! We are very happy that you enjoyed your stay. I apologize about the sleeper sofa situation. It is a queen sleeper sofa so it does sleep 2 people but I understand if the groups preference would be to use that for 1 person depending on sleeping arrangements. We were really happy with this rental! The furnishings were nice, location was great, nice layout, everything was clean, and there was plenty of room for all of us. It was especially nice to have 3 couples and two kids each have their own bathrooms with the bedrooms! Thank you for your feedback Teresa! We are very happy that you enjoyed your stay at the beautiful Rachel Lane. Are stay at Rachel Lane was unbelievable,the house was more then we expected from the amenities,to the beautiful views this place was excellent,the only thing that could make this place better would be is it had more kid friendly outside space for them to play.We will definitely stay here again. Thank you very much for this feedback Amber! Rachel Lane is definitely a beautiful property. We look forward to hosting you again in the future! Fabulous stay at Rachel Lane! The house was gorgeous, the furniture was adorable and made us feel quite 'rustic' while still being in a modern home, and having two well-stocked kitchens was great. The only thing I will say is that in the description, it reads "2 kings, 2 queens, 1 bunk, and 1 other" for bed space. This was not accurate. There was only 1 king, 2 queens, 1 bunk (which had a double bed beneath, and a twin on top), and a pullout/futon. There was also a double cot available. It was a little disappointing to have made plans for 2 king and 2 queen beds and having to make adjustments (which made some of our party unhappy), but overall didn't ruin our stay. The shuttle stop is about a five minute walk away, which was great! It's on the purple line. Summit Rentals provides a great welcome packet with maps of the shuttle routes, and it's pretty easy to figure out. Overall I would definitely stay here again. We traveled to Breckenridge with four other couples. The house was roomy, comfortable, and equipped with everything we needed. The kitchen was stocked with a great variety of utensils, pots/pans, serving bowls/platters, and small kitchen electronics. The downstairs is its own little apartment and was the perfect space for one of the couples who brought their teenage daughter. The master bed/bath was luxurious and very comfortable. We will be booking this property again!!! We had a very good rental experience in every respect. Great location and mountain views. The only negative feedback that we would leave is that the TV in the main gathering area (1st floor) is extremely unsuitable for such a nice unit. TVs in all other areas are great but the one that is watched the most by everyone is poor. Can't even get all the same channels that the other ones have. Strange? Unit was advertised as sleeping 12. There were 11 of us and I brought a blow up bed. We could not acsess the sleeper couch so we had to have our 6'4 grandson sleep on the floor on the blow up bed. There were 6 adults, 2 teenagers and 3 children under 12. Otherwise, it was fine. The house was beautiful, well maintained, great location and views! Our family of eight had plenty of room and very well stocked kitchen. Will definitely rent this property again! Mark, Thanks for your feedback. I am glad that we were able to accommodate you in another property after the flooding and hope that you still had a wonderful time. Rachel Lane is a great home that tends to be a favorite for most. Hopefully you can come back to Breckenridge and stay in this home. What a brilliant winter vacation home! Everything you can imagine is included with this home. The kitchen is fully equipped for making meals for multiple families and if you run out of space there is a second kitchen downstairs! The master bedroom is gorgeous! The only issue is hot water. I am not sure if it is an issue of a small hot water heater or something else, but with any more than 6 people in the house you will have to cycle showers. Even so, this is a property that is high on our list. Without a doubt we would stay there again. Perfect location, short walk to the bus stop to get into town and to the gondola. The inside was beautiful and we weren't lacking for anything, it felt just like being at home, but with a hot tub! I don't think we could have found a better place and would definitely go back! This was a great location for a gathering of family. 4 bedrooms across 3 floors, many amenities to satisfy everyone. Beautiful views, great location. Late Arrival - No Problems! The ladies had all the paperwork in the night arrival box and were very patient with my returning the signed papers after the second day. Our second day after skiing was spent in the Emergency room so the papers were late. Nice condo. which accomodated our 10 very well. Bus route worked well. Don't understand why the 46" LCD TV is in the basement while the smaller LCD is in the living room? May be a story behind that question. We had a great time. There was plenty of room for the family to spread out and have our own space. Beautiful home. GREAT PLACE!! Will book again!